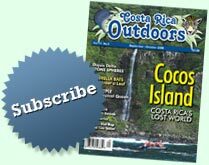 In addition to our trip-planning service, Costa Rica Outdoors has published a leading magazine on the sport, travel and culture of Costa Rica since 1994. Our articles provide a unique perspective on the wide variety of experience Costa Rica offers, detailed maps of the country and sound advice as to where and when to visit this Central American paradise. Visit the links below to past articles and sign up for a subscription today, for yourself or as a great gift!